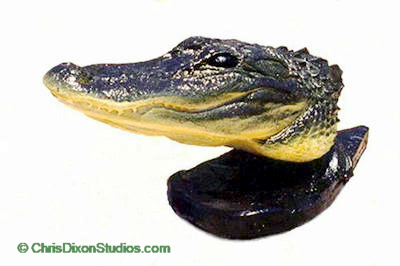 American alligator replica is so real that we have captured his 'crocodile smile'. Photo realistic lifesize, however, our gator will not bite you! Alligators mature in about 8 to 13 years at 6 to 7 feet, laying 20-50 eggs incubated in a nest of warm decaying vegetation for 65 days. Then growth continues slower, however, old male 'gators' can be 15 feet long and weigh 1,000 pounds during a lifespan of more than 30 years. The American alligator is a conservation success story of state and federal cooperation, and the endangered species program. Restricting market hunting, restoring protected wetland habitat, commercial breeding and education all combined to revive the number of alligators. 'Gators' have survived for 200 million years. The American alligator was an endangered species listing in 1967 under a law that prior to the 1973 Endangered Species Act. It was in danger of extinction throughout a significant portion or all of its range. In 1987 the US Fish and Wildlife Service removed the alligator from the endangered species list. Some related species of crocodiles and caimans are still endangered animals. The Fish and Wildlife Service still regulates trade in alligator skins and products in order to protect those that are endangered. The saltwater crocodile, however remains very endangered. Loss of pollution free and peaceful natural habitat is a major factor in the saltwater crocodiles needs.